It’s office party season again. And despite the “credit crunch” there’s still scope for some serious fun. But what happens when you are asked to give the office party speech? What about when you have to thank all the staff in credit control or congratulate the sales team. Your party enthusiasm might be dimmed. But with some festive cheer, here’s a reminder on the essential speaking techniques for the office party speech. Who knows, it might even be the funniest speech in the office this year. First plans. Identify the type of speech you want. Then, do some planning, jot down an idea or two and be ready for any surprises. Then, you can take a look at the party venue. Work out the best location from which to speak. If party music is planned you should be able to use a microphone—essential kit for a noisy party atmosphere. Drinks. Don’t even think about public speaking when the party drinks have been flowing a long time. That’s because your audience’s attention will be elsewhere and interruptions are inevitable. And of course, it goes without saying, you shouldn’t consider trying to give a speech yourself when you have had one or two. It doesn’t work and is often embarrassing! That was the outcome after this Mariah Carey speech in Palm Springs. Starters. Aim to speak near the beginning of the party when people have arrived, had a drink or two and conversation is flowing. If dinner is being served aim to speak before dinner. It’s not an after dinner speech. The next course. If you have organised the party then it’s best to say a quick thank you to the hotel or catering staff. Or, if your office manager has organised the party it’s definitely best to thank them for all their hard work. It’s always a challenge organising the office party, so a big thank you will be well received. Presents. The office party is a good time for some other thanks – for people or teams. When thanking people remember to get the technique right. So, for example, “And now, someone who’s always committed to the customer, someone who always puts their customer first, someone who it is a pleasure to work with…[pause]…first name, second name”. Applause will start spontaneously when you get it this way round. However, if you name the person and then keep talking the audience loses track of the applause point. More Presents. For a more solid appraisal of someone consider listing their “virtuous” points and then compare them with something less “virtuous”. First, detail two of their virtues with a small anecdote–their commitment and their ability, perhaps. Then detail a less-virtuous point that will get either a laugh or a wry acknowledgement—their taste in business suits or performance in the company 5-a-side league. The idea is not to be cruel! Then detail their final virtue—sense of humour, perhaps. Lastly, name them using the first name, second name technique. Be brief. Very brief. You can do the strategic review at another event! Seriously, the office party speech has to be brief. Party lights. Note some closing points that will be important later in the evening…”taxis are on the company account” or, “the office opens at 1100 tomorrow”, or “the band is playing an extra hour until 0100”. These are good news points. They are easy to make and they work well. And finally. Round off the office party speech with a toast along the lines of…”To ourselves, To absent friends and To the future”. Because in today’s economic climate, that’s about right. Party…party. Now it’s time to relax and enjoy the party. Roll on the New Year. 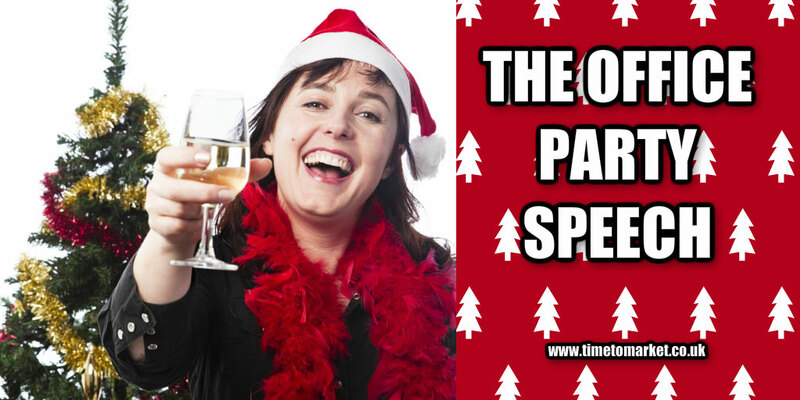 It’s short, it’s friendly and it’s upbeat–it’s the office party speech. You can read all the tips for how to give your year end speech at this time of year. Aim to set the mood and tone for the office year ahead with your year end speech. You can learn more tips and techniques about the office party speech with a public speaking coaching session at your offices or an off-site training centre. So, whatever the occasion, please don’t hesitate to get in touch.